Yesterday it was appetizers, today: the main courses from our 13-courses dinner. Which, funnily, are nearly identical. The instructions were simple. Each couple was to prepare three small dishes - an appetizer, a main dish and a dessert. I kind of cheated, and made a few more appetizers and small dishes, rather than a main dish, since I thought we'd be very full anyway. Which I was right about. But, as it happens, but Lena & Nico and Tesse & Danne decided to bring fish soup for the main course! What are the odds of *that* happening? 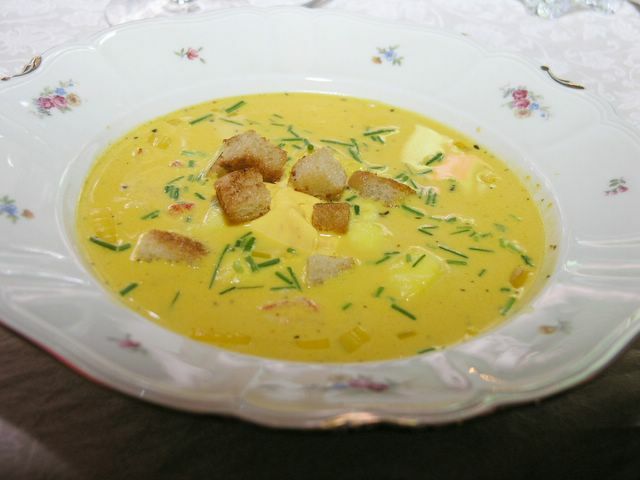 So, we had two rather different fish soups, which in retrospect, was absolutely great. I loved being able to compare and contrast - and I was joyous about getting to eat two such fantastic soups without having to do any work! Here's Tesse & Danne's soup. It had halibut and monkfish, and was served with garlic croutons and a saffron aïoli. It was absolutely great, so I wheedled the recipe out of Tesse. It's a cherished family recipe, but I got her permission to share it with you. Which I will, as soon as she sends it to me. And here's Lena and Nico's soup. 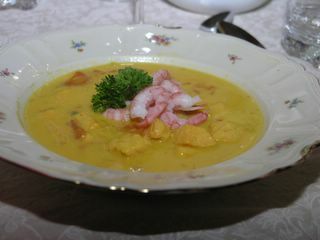 It was also saffron based, but had salmon and shrimps. The aïoli was a gorgeous light green from the olive oil used - so pretty! WOW! Look at all this glorious food! I wish I was there to enjoy it ... what a wonderful meal you have put together, Anne!